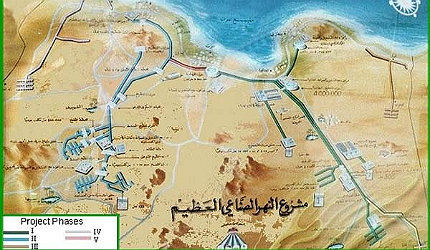 Enka Construction & Industries; Thyssen Krupp Fördertechnik; Al Nahr Co.
Map of Libya. The GMR project draws water from aquifers beneath the Sahara and conveys it along a network of huge underground pipes to the coastal belt. Excavation work in the desert. Phase I of the project alone required 85 million cubic metres of excavation before a quarter of a million sections of concrete pipe, spanning some 1,200km, could be laid. Schematic map of the project. It is designed in five phases, which eventually combine to form an integrated system. 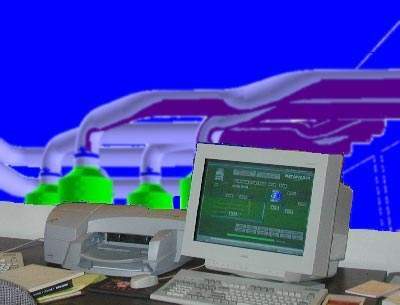 Computer simulation of a Phase III control room. The project's communication and control systems make extensive use of microwave, radio and extranet technology to co-ordinate operations. The Libyan Desert, not far from Ajdabiya, on the Phase I route. Little is visible above ground to suggest the scale of the pipeline passing beneath the sand which supplies Benghazi and Sirte. 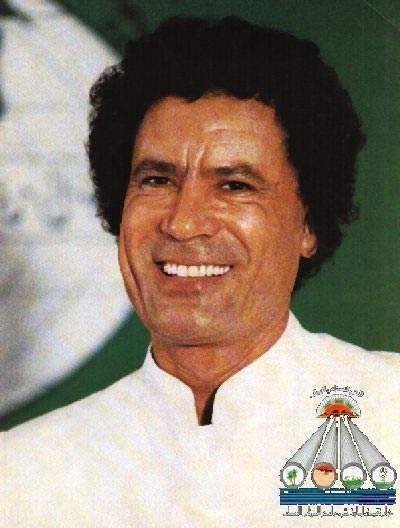 Colonel Muammar Gaddafi at the formal inauguration of Phase I of the project, in August 1991. The Libyan leader played a major role throughout the project and took a close interest in its progress, describing it as the "eighth wonder of the world". On 22 July 2011 Nato warplanes attacked a pipe making plant at Brega killing six of the facility's security guards. Image courtesy of Jaap Berk. Contracts were awarded in 2001-02 for the next phase of Libya’s Great Man-Made River project, an enormous, long-term undertaking to supply the country’s needs by drawing water from aquifers beneath the Sahara and conveying it along a network of huge underground pipes. Fouka Desalination Plant is a sea water reverse osmosis (SWRO) desalination facility located in Fouka, in the Tipaza province of Algeria. In October 2001, the Great Man-Made River Authority (GMRA) awarded an $82m contract for the construction of major new pumping facilities to a consortium led by Frankenthal KSB Fluid Systems. In January of the following year, the Nippon Koei / Halcrow consortium was selected to provide the preliminary engineering and design works for phase III of the operation, worth $15.5m. The pumping station was completed and KSB was subsequently responsible for servicing the plant and providing technical support for one year after completion. In phase III, an additional 1,200km of pipelines were laid, which ultimately increased the total daily supply capacity of the existing system to 3.68 million cubic metres and provided a further 138,000 cubic metres a day to Tobruk and the coast. Phase III was completed by 2009. On 22 July 2011 Nato warplanes attacked a pipe making plant at Brega killing six of the facility’s security guards. Nato claimed that the building had been used as a military storage facility and rockets were launched from there by pro-Gadaffi troops. The attack came shortly after Libya warned that Nato-led air strikes could cause a "human and environmental disaster" if air strikes damaged the Great Man-Made River project. Reports indicate that damage to infrastructure was not serious enough to completely stop the river from running. New Cairo Wastewater Treatment Plant is the first public-private partnership (PPP) project in Egypt. In 1953, the search for new oilfields in the deserts of southern Libya led to the discovery not just of significant oil reserves, but also vast quantities of fresh water trapped in the underlying strata. Most of this water was collected between 38,000 and 14,000 years ago, though some pockets are only 7,000 years old. There are four major underground basins. The Kufra basin, lying in the south-east, near the Egyptian border, covers an area of 350,000 square kilometres, forming an aquifer layer more than 2,000m deep, with an estimated capacity of 20,000 square kilometres in the Libyan sector. The 600m-deep aquifer in the Sirte basin is estimated to hold more than 10,000 square kilometres of water, while the 450,000 square kilometre Murzuk basin, south of Jabal Fezzan, is estimated to hold 4,800 square kilometres. 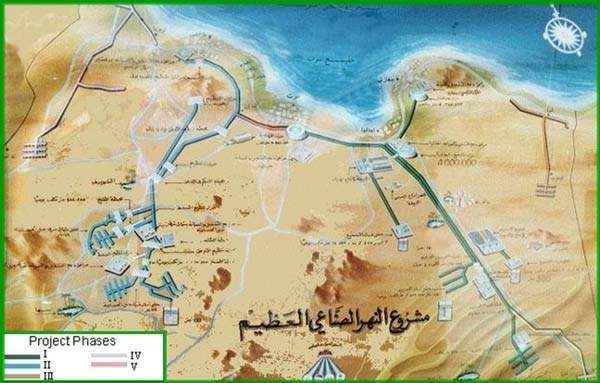 More water lies in the Hamadah and Kufrah basins, which extend from the Qargaf Arch and Jabal Sawda to the coast. The GMR project – the world’s largest engineering venture – is intended to transport water from these aquifers to the northern coastal belt, to provide for the country’s 5.6 million inhabitants and for irrigation. Intended to be the showpiece of the Libyan revolution, Colonel Muammar Gaddafi called it the "eighth wonder of the world". First conceived in the late 1960s, the initial feasibility studies were conducted in 1974, with work starting ten years later. The project, which still has an estimated 25 years to run, was designed in five phases. Each one is largely separate in itself, but will eventually combine to form an integrated system. "In 2001, the Great Man-Made River Authority (GMRA) awarded an $82m contract for the construction of major new pumping facilities to a consortium led by Frankenthal KSB Fluid Systems." The first and largest phase, providing two million cubic metres a day along a 1,200km pipeline from As-Safir and Tazerbo to Benghazi and Sirte, via the Ajdabiya reservoir, was formally inaugurated in August 1991. This was a massive undertaking, using a quarter of a million sections of concrete pipe, 2.5 million tons of cement, 13 million tons of aggregate, two million kilometres of pre-stressed wire and requiring 85 million cubic metres of excavation, for a finished cost of $14bn. 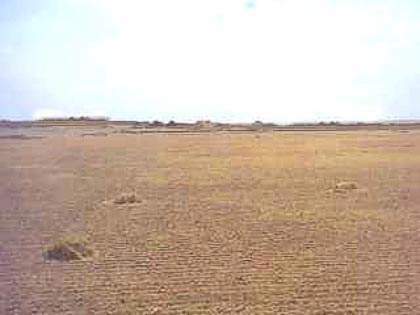 The Tazerbo wellfield consists of both production and piezometric observation wells and yields around one million cubic metres a day at a rate of 120L/s per well. Only 98 of the 108 production wells are used, with the others on stand-by. A collection network conveys the water to a 170,000 cubic metre off-line steel header tank. From here, the main conveyance system is routed 256km to the north, to two similar header tanks at Sarir, where the second phase I wellfield is located. A further one million cubic metres are produced here, using 114 of the 126 production wells, at an average flow rate of 102L/s per well. The wells at both Tazerbo and Sarir are about 450m deep and are equipped with submersible pumps at a depth of 145m. From Sarir, two parallel, four metre-diameter pipelines convey the now chlorine-treated water to the four million cubic metre Ajdabiya holding reservoir, 380km to the north. The water flows from this 900m-diameter reservoir through two pipelines, one heading west to Sirte and the other north to Benghazi. Each pipeline discharges into a circular earth embankment end reservoir, with a storage capacity of 6.8 million cubic metres at Sirte and 4.7 million cubic metres at Benghazi, which have been designed to balance fluctuations in supply and demand. 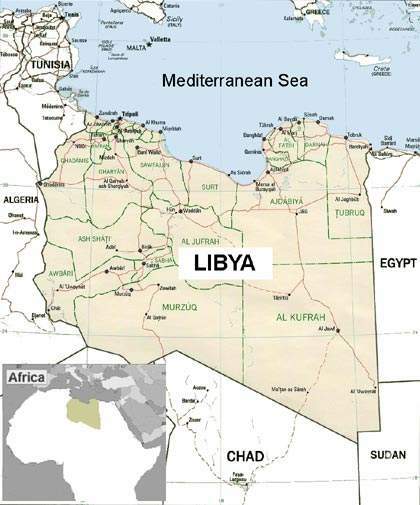 In addition, large reservoirs – 37 million cubic metres in the Sirte area and 76 million cubic metres in Benghazi – have been built to act as storage facilities for summer or drought conditions. 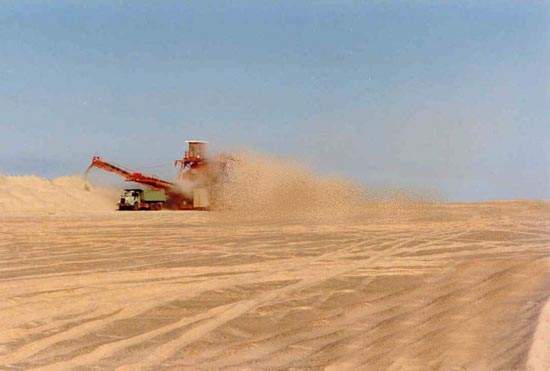 Phase II delivers one million cubic metres a day from the Fezzan region to the fertile Jeffara Plain on the western coastal belt, as well as supplying Tripoli. The system starts at a wellfield at Sarir Qattusah, consisting of 127 wells distributed along three east-west collector pipelines, ultimately feeding a 28 million cubic metre terminal reservoir at Souk El Ahad. Phase III was divided into two main parts. Firstly, it provided the planned expansion of the existing phase I system, adding an additional 1.68 million cubic metres a day, along with 700km of new pipelines and new pumping stations to produce a final total capacity to 3.68 million cubic metres a day. "In phase III, an additional 1,200km of pipeline was laid. Phase III was completed by 2009." Secondly, it supplied Tobruk and the coast from a new wellfield at Al Jaghboub. This required the construction of a reservoir south of Tobruk and the laying of a further 500km of pipeline. The preliminary engineering and design contract runs for 41 months and includes geotechnical and topographical surveys. Conceptual design phases feature extensive consideration of pipeline routing and profiling, hydraulics, pumping stations, M&E, control / communications systems, reservoirs and other structures, corrosion control, power, operational support and maintenance provision. Evaluation of tenders for the detailed design was completed in the first quarter of 2005. 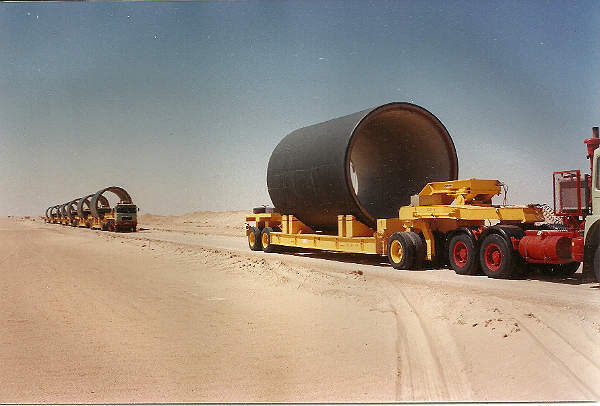 The last two phases of the project involved extending the distribution network together with the construction of a pipeline linking the Ajdabiya reservoir to Tobruk, and finally the connection at Sirte of the eastern and western systems into a single network. When completed, irrigation water from the GMR will enable about 155,000ha of land to be cultivated – echoing the former Libyan leader’s original prediction that the project would make the desert as green as the country’s flag. Malawi’s District Water Supply Phase III (DWS III) project is an integral part of the country’s national water services development master plan. The project is owned by the Great Man-Made River Authority (GMRA) and funded by the Libyan Government. Brown & Root and Price Brothers produced the original project design and the main contractor for the initial phases was Dong Ah, with Enka Construction and Al Nah acting as sub-contractors. The preliminary engineering and design contractor for phase III is the Nippon Koei / Halcrow consortium. The Frankenthal KSB consortium won the pumping station construction and technical support contract, with SNC-Lavalin responsible for the pipe production plant O&M. Libyan Cement supplied the concrete. Thane-Coat and Harkmel provided pipeline coating services, while Corrintec supplied the cathodic protection system. ThyssenKrupp Fördertechnik provided technical services for the excavation planning, with a number of local companies carrying out elements of construction and ancillary work.